Domestic ferrets, though closely related to the black-footed wild ferret, are actually not like their closest relatives. In fact, they seem as though they would be more closely related to dogs. While ferrets and dogs look and act differently, some of their traits are similiar. For example, both dogs and domestic ferrets tolerate eye-contact with their owners for a long period of time unlike their wild counterparts (Hernadi, 2012). When faced with choice tasks, the domestic ferrets choose their owners over the experimenter, while the others showed no preference. This shows that domestic animals are more suited to interacting with humans than other species. Ferrets are social creatures that love to play around with their friends and toys. They are able to interact well with some pets, but could be problematic with others (rodents, reptiles, and birds). As fun-loving creatures, ferrets love to play with other creatures. Domestic ferrets can play hard, and even with good intentions could harm another pet. Ferrets being meat-eaters may hunt and chase anything that could be a potential prey, and may view birds, small rodents, insects, and reptiles as a potential snack (Matulich, 2001). Ferrets are socially aggressive animals, and lack the fear of things that are bigger than themselves. Cats have a tendency to run away from the forwarding behavior ferrets exhibit so they will usually get along well, but keeping a watchful eye on them while they interact will help avoid any tussle that may occur (Mcleod,2014). Domestic ferrets interaction with dogs could be dangerous, but this all depends on the individual dog themselves. This relationship between the two is complicated. A dog can inadvertently hurt the ferret while playing, or snap at the ferret if it gets too close to the dog's food or toys (Mcleod, 2014). Predation-wise, ferrets have no true natural predators, since they are domestic. If given the chance, plenty of animals like owls and hawks would prey upon them. Ferrets, however, do sometimes prey on other animals, such as birds, rabbits, and other small animals (Hernadi, 2012). Some owners use the domestic ferrets to hunt these types of animals, called ferreting. 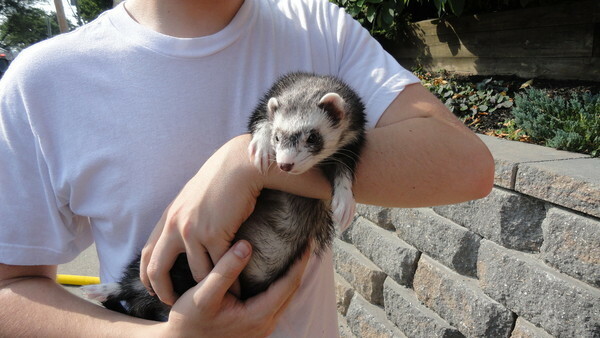 Because ferrets are mostly used as pets, their diet does not consist of many small animals, but rather manufactured ferret food.